AlGalCo to Present at JCC Earth Day Celebration! Our Hydrogen on Tap patented process is a vetted alternative energy solution. Hydrogen on Tap . . .
Comes from aluminum which is completely renewable! We produce hydrogen on demand simply by adding water to an alloy that is comprised of over 90% common aluminum. AlGalCo was founded in 2006 and has the exclusive license to commercialize our patented new technology in which hydrogen is generated on demand simply by adding water to a solid alloy comprised of over 90% common aluminum. Our process eliminates the need for high pressure containers and pipelines for creating and transporting hydrogen. The alloy can be safely stored at standard temperature and pressure. As the feedstock is ordinary aluminum, the spent alloy (alumina) can be recovered and recycled back into the original alloy an indefinite number of times by deploying 100-year old aluminum industry standard techniques. Any type of water will actuate the reaction. Applications - the sky's the limit! Hydrogen can be used to partially or in whole replace gasoline in standard internal combustion engines (ICE) and fuel cells. Commercial applications include range extender for all electric vehicles and fuel mileage enhancement in existing cars and trucks. Military applications include balloon inflation and JP 8 fuel replacement for generators at remote locations. 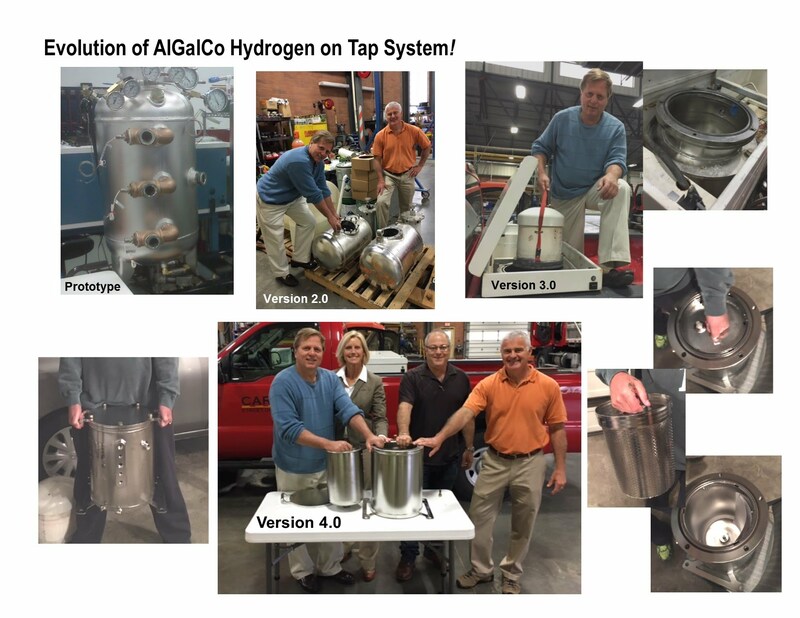 Introducing AlGalCo Hydrogen on Tap 4.0! eliminated, while doubling the quantity of on-demand hydrogen produced. especially for those operating under some form of green initiative. After reacting with water, the aluminum becomes alumina which can be recycled back into our original aluminum alloy. The other 10% of the alloy is a naturally occurring element discarded as waste during the bauxite mining process. It serves only as a catalyst and is not consumed in the reaction. The scope of the project was to design a power electronics system which would modify an existing hydrogen fuel cell powered electric go-kart to drive the 1.2kw DC motor with a photovoltaic (PV) panel, ultracapacitors and a battery. "Hydrogen on Tap" was provided by AlGalCo. After nearly 10-years in research, development, & testing... AlGalCo rolls out its first product for sale. This first of its kind true Hydrogen on Demand system is fleet-ready, and offers a solution for your green initiative! All from a totally renewable, domestic source!